extreme minuteness of light waves their bending around obstacles may be readily observed. 2. The extreme minuteness of light waves renders it possible to utilize the microscope and the telescope as instruments of great precision. These instruments depend on the property of the objective of gathering together waves from a point so that they are concentrated in the diffraction pattern which is called the image. 3. 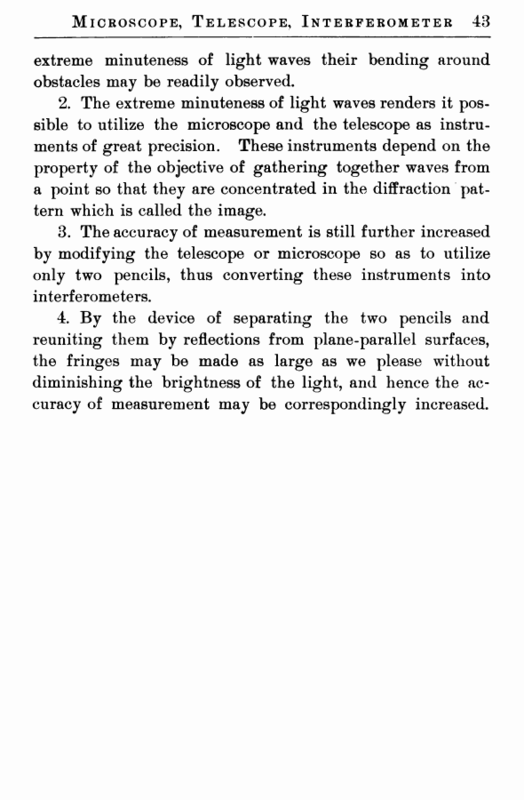 The accuracy of measurement is still further increased by modifying the telescope or microscope so as to utilize only two pencils, thus converting these instruments into interferometers. 4. By the device of separating the two pencils and reuniting them by reflections from plane-parallel surfaces, the fringes may be made as large as we please without diminishing the brightness of the light, and hence the accuracy of measurement may be correspondingly increased. In the last lecture we considered the limitations of the telescope and microscope when used as measuring instruments, and showed how they may be transformed so that the diffraction and interference fringes which place the limit upon their resolving power may be made use of to increase the accuracy of measurements of length and of angle. We have named these new forms of instrument interferometers and illustrated many of the forms in which they may be made. 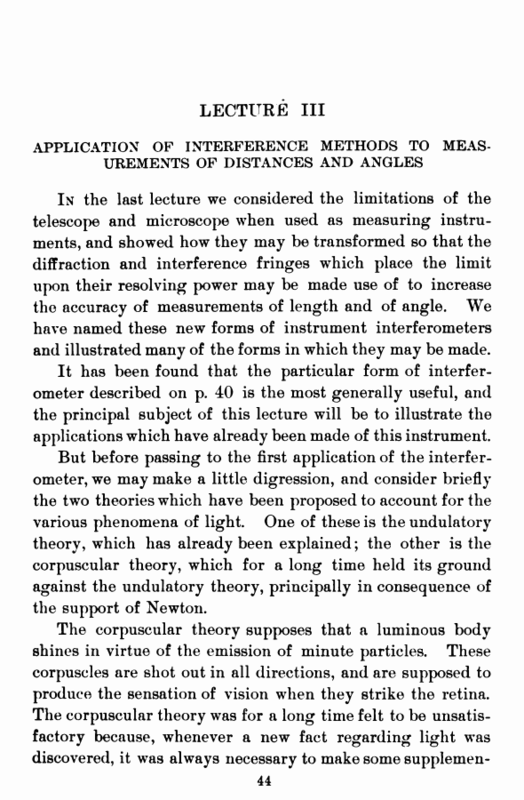 It has been found that the particular form of interferometer described on p. 40 is the most generally useful, and the principal subject of this lecture will be to illustrate the applications which have already been made of this instrument. But before passing to the first application of the interferometer, we may make a little digression, and consider briefly the two theories which have been proposed to account for the various phenomena of light. One of these is the undulatory theory, which has already been explained; the other is the corpuscular theory, which for a long time held its ground against the undulatory theory, principally in consequence of the support of Newton.